On your report visit we explain what we found and how we might be able to help you. This visit is probably the most important visit clinically that you will have. During this visit the patient will watch a short video that helps them distinguish normal versus abnormal x-rays. The doctor will then come in and give you a full “report of findings”. 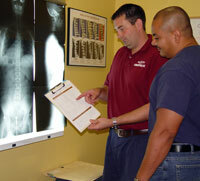 We will go over your x-rays and all the findings from the exam from the first visit. We will then give you our recommendations for care and begin with your first adjustment. This visit typically takes 30-45 minutes. Contact Bassett Family Chiropractic now to schedule an appointment with your Chiropractor in Shelby Township.